Every professor demonstrates support and encouragement for the success of all of their students. The theatre department in particular has prepared me for a career. Since the department conducts all classes, rehearsals, and shows as if they were professional productions, there are no surprises when entering the field. Brielle Levenberg has excelled in her academic and artistic undergraduate career. A Premiere Award launched her time at UMBC and she has continued to distinguish herself as a member of the Honors College, Phi Kappa Phi and Phi Beta Kappa, with a 4.0 GPA. Her numerous awards include the 2015 Theatre Department Award for Outstanding Academic Achievement, 2016 Theatre Department Award for Outstanding Achievement in Performance, and 2016 Modern Languages and Linguistics Overall Academic Achievement Award. 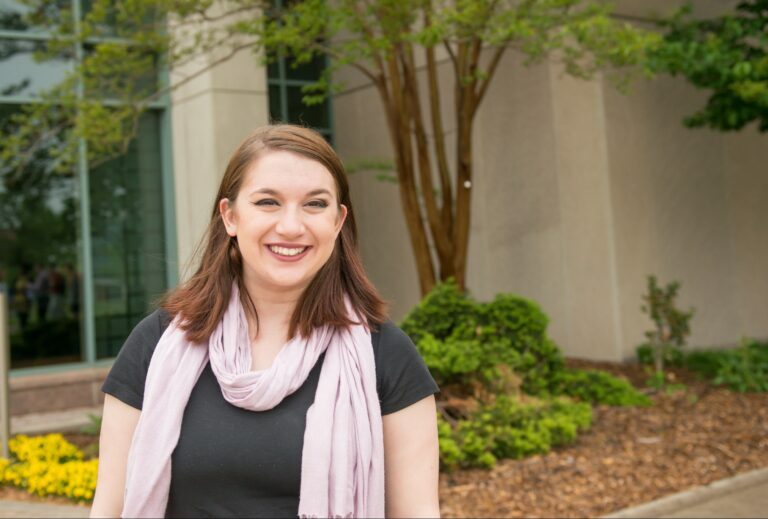 Levenberg has been an active student leader, serving the Musical Theatre Club as president, 2014-2016, and as treasurer for the AF Theatre Company. She was nominated for the Irene Ryan Acting Competition at the Kennedy Center American College Theatre Festival for Region II based on her work in the world premiere of Voracious by Susan McCully, senior lecturer in theatre. After graduation Levenberg plans to audition for roles in the New York area, and to teach and work as an administrator at From Stage to Screen Performing Arts Academy in Huntington, New York. Levenberg eventually plans to pursue TV and film work in California. Images: Theatre’s 2013 performance of Eurydice, Brielle Levenberg’s first production at UMBC. “I am reaching forward in the picture, which says to me that the best is yet to come.” Photo courtesy of Brielle Levenberg. Portrait courtesy of Marlayna Demond ‘11 for UMBC.